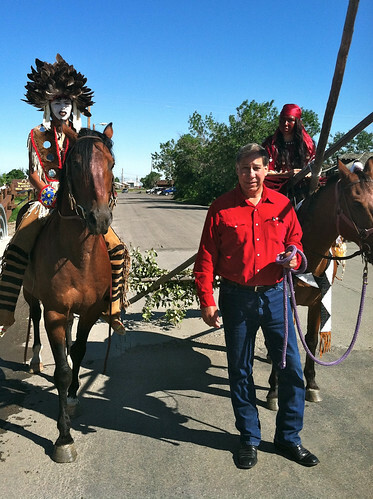 During the North American Indian Days Celebration in Montana, Under Secretary Ed Avalos (foreground), witnessed the pride and commitment of youth as they celebrated their cultural and agricultural roots. Agricultural producers in rural America represent less than 1% of the U.S. population, yet they produce almost 75% of the food we eat in this country and much of the food eaten throughout the world. Among that 1%, the average age of the American farmer is 57 years old—making it imperative for us to engage and encourage young people to pursue agricultural careers. Earlier this summer, while visiting Browning, Montana, I had the opportunity to meet with Dr. Billie Jo Kipp, President of the Blackfeet Community College (BCC) and Mr. Terry Tatsey, Director of Agricultural Programs at the college. Their efforts and commitment to educate local students and keep young people in agriculture is inspiring. At BCC, programs like the Native Science Field Center use outdoor classrooms to give students hands-on experience in cataloging native plants and their relationships to nearby water sources. The experience, supported through the Blackfeet Community College Extension, is a marriage of cultural and agricultural studies. It passes knowledge between generations and encourages young people to pursue a future in science, technology, engineering and mathematics (STEM) careers as well as agricultural fields. The trip also gave me a chance to participate in the North American Indian Days Celebration. Here I met with tribal members, attended a 4-H livestock sale, participated in the rodeo and witnessed the pride and commitment of the young people as they showcased both their cultural and agricultural traditions. At USDA, we are committed to providing American Indians and Alaska Natives equal access to all of our programs. Our Office of Tribal Relations works with Indian Country, providing support across all USDA programs for tribal consultation, sacred site efforts, cross-agency federal programs and the recently created White House Council on Native American Affairs. On my recent visit to Wisconsin, I had the honor to attend the opening day festivities at the Wisconsin State Fair. Originating in the early mid-1800s, state fairs are a celebration of foods and the rural communities that produce them. They are a showcase of rural America—shining a spotlight on farmers, ranchers, dairy producers, agribusiness and the communities that surround them. Having been in agriculture in one form or another all of my life, going to the state fair is still exciting and fair season is one of my favorite times of the year. Along with attending a dairy show, touring the agriculture pavilion—not to mention stopping to enjoy some potato pancakes, sweet corn and a traditional crème-puff—I was able to attend the Wisconsin fair’s lamb show. This gave me an opportunity to visit with some of the state’s young producers who were striving to win their class and make the sale. These young people represent the future of agriculture, and are just one example of the up-and-coming farmers and ranchers who will feed our nation in the years ahead. Through programs like USDA’s Start2Farm initiative, funded through the National Institute of Food and Agriculture (NIFA), and opportunities like the Specialty Crop Block Grants (SCBG) and Farmers Market Promotion Program, managed by the Agricultural Marketing Service (AMS), we are committed to creating opportunities in rural America. By cultivating a passion for agriculture in students and supporting beginning farmers and ranchers, we will help build the future of agriculture and show that we do not take for granted the work they do to feed us all. We are dedicated to keeping families on the farm and creating opportunities for future generations. 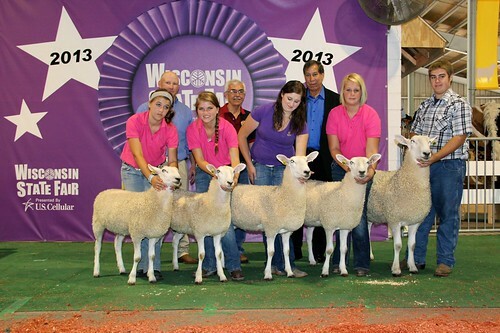 When visiting the Wisconsin State Fair, Under Secretary Avalos (third person, back row) attended a lamb show and had the opportunity to meet with some of the farmers and ranchers who will feed our nation in the years ahead. Read about CASA’s upcoming beginning farmer training on 28 August. A Vegetable Production, Marketing & Water Quality Progam September 10, 2013 – 9:00 a.m. to 3:00 p.m.
September 10, 2013 – 9:00 a.m. to 3:00 p.m.
9:00 a.m. – David Sours: Public House Produce offers over 80 varieties of fresh produce, free range brown eggs. 1:00 p.m. – Jeff Jennings: Long Acres Produce offers sweet corn, melons, peppers and tomatoes. Come learn about ongoing research at Virginia State University Randolph Farm located in Petersburg, VA. Research and Extension presentations will raise small farm producer awareness about small farm production and marketing. Drs. Adnan Yousuf, Michelle Corley and Vitalis Temu will highlight Small Ruminant Research, Forage Ecology and Management. Dr. Stephan Wildeus presents current research on hair sheep reproduction. Can “Weeds” and “Forages” make Big Bucks? Drs. Laban Rutto and Maru Kering share information regarding crops viewed as “weeds” or “livestock feed” being considered for functional food market. Theresa Nartea, Extension marketing specialist and invited Virginia local food industry leaders discuss how small farmers can capitalize on functional food markets in Virginia.